We learned just over a year ago that Respawn Entertainment, the studio that makes the Titanfall games, is working on a Star Wars game. We now know the name of that game, Star Wars Jedi: Fallen Order, a little about its story, and roughly when it’s coming out. It follows a surviving Padawan and is set shortly after the events of Star Wars: Episode III – Revenge of the Sith. It’s a dark time for the Jedi, with the order largely scattered across the galaxy, in hiding or on the run. Emperor Palpatine is in control and his Clone Army is ruling with an iron white plastic fist. It is said to be a third-person action-adventure title – though, this being made by Respawn means its shooting should be top quality. And, yes, you will be able to use a lightsaber. If you’re looking for more E3 2018 trailers, news, and announcements, we’ve got you covered. As great as it is to hear Respawn’s Star Wars game is coming along, I was really hoping there would be some Titanfall 3 news. 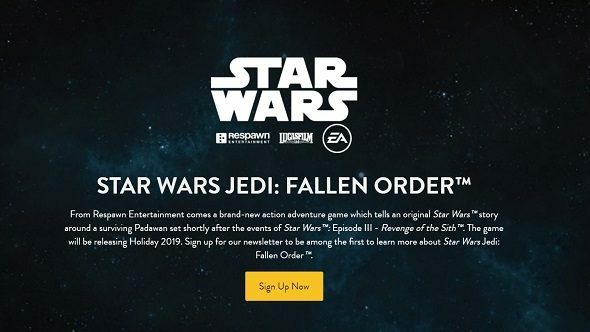 You can sign up on the website to find out more about Star Wars Jedi: Fallen Order. Though, with the game not due out until, what Vince Zampella describes as “holidays 2019”, Respawn may be quiet on the details of this one for quite a while yet.